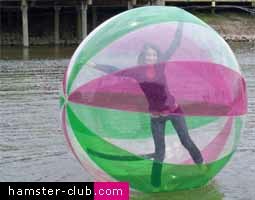 The Human Hamster Ball is a great and original way to pass your free time! One can use a Human Hamster Ball for a maximum of 15 minutes (when used on hot sunny days), or as long as you want if there is no sun or if used at night but the air has to be changed every 20 minutes. This is one of the best ways to build up your strength, balance, endurance and it�s a lot of fun as well! So, if you need a workout, walking and controlling the water walking ball can be a real challenge. The trick is to hold onto the sides of the ball as you lean forward and walk or run slowly. Just a little practice and soon you will be walking on water easily. Want to see some fish without using a snorkel and without getting wet? It is really amazing - inside the water walking ball you can see fish as you're floating around on top of the water. You can even use a flashlight at night to attract them to swim up under the Human Hamster Ball! !